Dann Huff (born November 15, 1960) is an American musician, songwriter and record producer For his work as a producer in the country music genre he has won several awards including the Musician of the Year award in 2001 and 2004 at the Country Music Association Awards and the Producer of the Year award in 2006 and 2009 at the Academy of Country Music. He is the father of American singer and songwriter Ashlyne Huff. 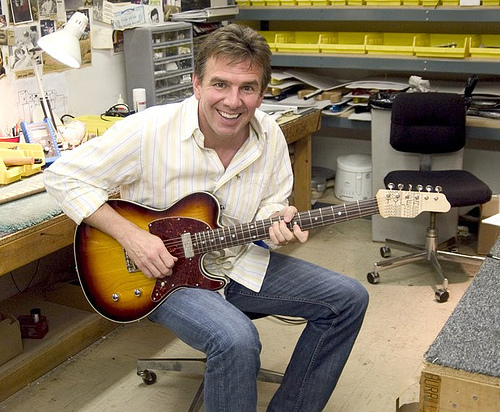 Dann Huff began his career as part of the original Christian rock band White Heart in which he played with his brother David Huff, and later in the melodic hard rock band Giant. He has since then been active as a session guitarist and producer in both rock music and country music with his first guitar recording debut for Ron Haffkine and Kyle Lehning. In the 1980s, Huff has played guitar on albums for Michael Jackson, Scritti Politti, Whitesnake, Roger Hodgson, Steven Curtis Chapman, Doro Pesch, Juice Newton, George Benson, Whitney Houston’s debut album Whitney Houston, Barbra Streisand, Kenny Rogers and more. Since the 1990s, Huff has been working as a producer for various bands and artists, some of which include Faith Hill, Megadeth, Rebecca St. James and Rascal Flatts. Some songs Huff has played on include Whitesnake’s 1987 US radio version of “Here I Go Again” and Michael W. Smith’s Go West Young Man.